I must admit, I did get a little sticky happy on the two above! I also keep a box with all my ready cut pretty papers and embellishments ready to decorate a card that I am creating…The die’s that are used with the machine to cut these pretty shapes have arrived on my desk by the lorry load (I really do not know how lol!) so that I can have the most fun possible whiling away the hours in my craft room…and boy does time fly! 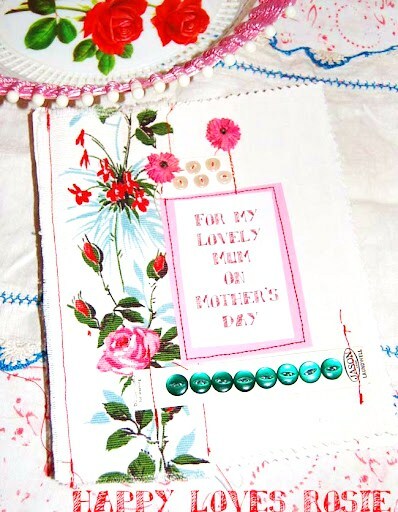 You know I have always loved to make things so I thought i would show you a picture of a card I made about 7 years ago!…funny thing about these cards though ( I made two similar ones), is that they went missing and I was never able to send them to our Mum’s…I had to buy some in the end! strange that! We always thought we had a ghost in the old house so perhaps the ghost took them lol! …and here we have the finished card!…as you can see i couldn’t resist adding a bit of sparkle! and a close up of the finished Birthday card! I am having a break from getting the house all ship shape and having a bit of me time, by having fun in this way!…my craft room is in so much mess…there is so many bits of paper on the floor. Its so nice though to just shut the door when I am finished with no mess in the house…although I do find paper trails…you know the little bits of paper that stick to your feet and then get dislodged in another room lol! What have you been creating this week?Do you like paper crafting?What cutting machine do you have? Do share with me…I’d love to hear from you.